The mysterious relationship between the mind and the brain, an unsolved conundrum pondered by philosophers and neuroscientists alike, formed the inspiration for this work. While the brain is part of the body, with physical, tangible properties, the mind is ephemeral. And whether the mind and brain are one in the same or different entities is still unknown. Some even propose that the physical world we inhabit, our reality, is just an illusion of the mind. In this virtual reality work, we search the brain to reveal the mind. The mind takes on a human form and activates the conscious brain, encouraging the viewer to participate in the process. While our body stays grounded to the earth, the mind continues to explore beyond our horizon, leaving us to believe that there are other realities somewhere out there. Though virtual, the experience is visceral, as it engages our sensory perception and questions our understanding of reality. 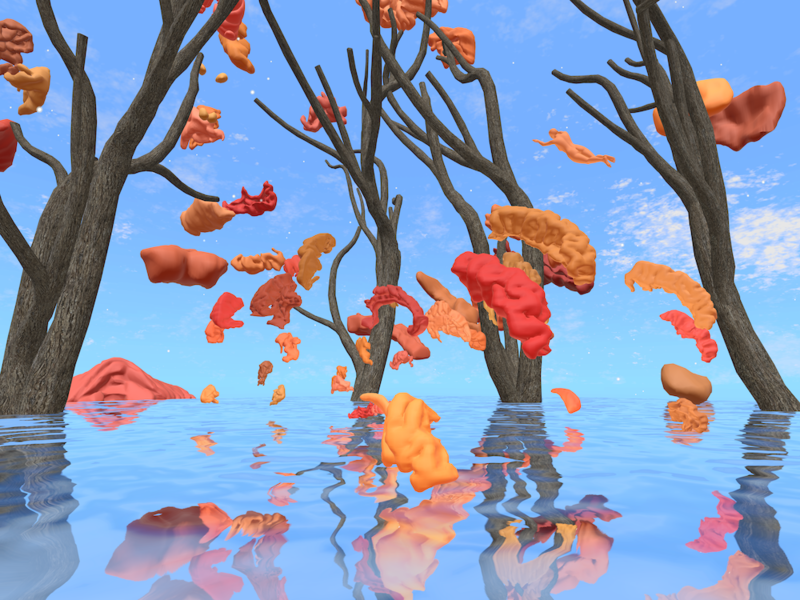 Continuing my interest in developing an aesthetic unique to the medium of VR, some components in the work are generative and will subtly change each time you try the experience – brain colors shift, tree shapes change, the “mind” follows different paths and viewer interaction creates variations in audio and animation. The model of the brain originates from MRI brain scans, while other elements – the sky, the water, the generic female form – were found freely available on the web. Rebecca Allen is an internationally recognized artist inspired by the aesthetics of motion, the study of behavior and the potential of advanced technology. For over thirty years her groundbreaking work has pushed the boundaries of art and creative expression in areas of experimental video, virtual and augmented reality, large-scale performance and interactive art. Rebecca moves fluidly between artist studio and research lab as her research informs her art. She is professor of Media Arts at UCLA and was founding chair of her department. Her current work in virtual reality involves the mysteries of human perception and is linked to research in neuroscience. Allen’s artwork is commissioned and exhibited internationally and is part of the permanent collection of Centre Georges Pompidou in Paris and the Whitney Museum and Museum of Modern Art in New York. Past collaborators include artists such as Kraftwerk, Mark Mothersbough, John Paul Jones (Led Zeppelin), Peter Gabriel, Carter Burwell, Twyla Tharp, La Fura dels Baus and Nam June Paik.